Equipment Description The center is equipped with 100 complete sets of Scubapro dive equipment, 150 dive-suits, UWATEC-computers and 10 complete sets of dive-gear for kids. All tanks and dive-gear will be loaded for you and your equipment can stay on the boats whilst you are here. We recommend taking cameras and diving computers back to your hotel room. The boats are made out of wood, most of them with a single engine and with available space for up to 20. They feature a large dive-deck with dive-platform, space for tanks and diving ...Continue readinggear, a sundeck, WC and the salon. Here the crew will serve a tasty lunch. All boats are equipped with O2, First Aid and VHF Radio. All boat excursions are accompanied by one of our dive guides. They are in charge of all your diving needs during your stay and will show you the best dive sites in Sharm el Sheikh. Two dives will be provided each day on different dive sites. 3rd dives and night dives are also available. Please discuss this with your dive-guide. Read before you go Ingrid and her team are in charge of the daily dive operation and they will do their out - most to make your stay as enjoyable as possible and show you the magnificent dive sites of the Red Sea. Most of your time will be spend with your Divemaster and Instructor. The first open water dives will take place in Naama Bay, right in front of the center, where a buoyancy park to practice the first skills has been installed. Three air-conditioned class rooms are equipped wit...Continue readingh the latest educational materials. There are many other team members involved to make sure that your dive holiday will be a complete success. 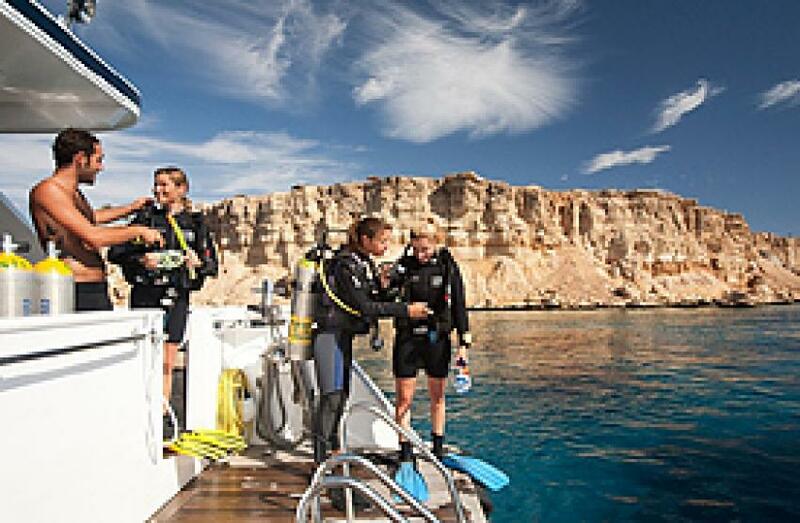 Sinai Divers is the best starting point for all diving activities. Clients should register at our counter shortly after their arrival in Sharm. Here they receive their diving-gear and the staff will brief the new arrivals about the schedule of the following days. All divers gear up in the center for the dives at the house-reef and the students get ready for their first open water dives. Opening hours are: 07:45 - 18:30 in Summertime, - 18:00 in Wintertime. One of many services provided by Sinai Divers is the transfer service from the different Hotels and the boat jetty to the center. Scheduled according to the departure and arrival times of the dive-boats. In connection with Hotel and dive reservations pick up from/ to the airport can be prebooked. Fully air-conditioned busses are available for these services. Divers will be picked up by our mini-busses from the hotels in Naama Bay. Meeting point of all guest is the dive-...Continue readingcenter. The boats leaving to the furthest dive sites depart at 8:00 am. Walking distance to the pier is 10 minutes. Meeting point is in the center. You will be transferred to the boat and back to the center by minibus. Depending on the distance of the dive site, the boats will return to the harbour between 4:00 pm and 6:00 pm.